With many games out there that offer the feeling of a true casino or simple card game, finding the most exciting and entertaining game among many can be hard. If you consider yourself as a fan of bridge games or you simply like to improve your skills of playing bridge and want to test yourself by competing with others, we searched and we have the right bridge game for that purpose. You will get your bridge lessons be a part of tournaments with this bridge game – Totally Bridge. What is Totally Bridge exactly? 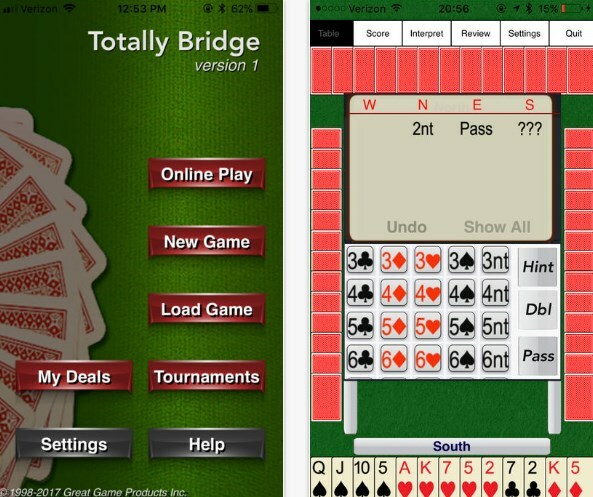 Totally Bridge is a bridge game based on the PC bridge game Bridge Baron, highly fun and addictive, developed for IOS users that love playing card games and compete. On this bridge card game, players get the chance to use the game’s bridge lessons and compete in bridge tournaments with their friends or with people worldwide, no matter where they are. Players can choose with who and how they will play, enjoying the game with quality functionalities and features, with a chance to win competitions. Monthly only needs to be paid $1.49 but the first 14 days are for free! When it comes to the functionalities and features offered by this bridge game, they are high-quality and highly practical and helpful when players need to improve their bridge skills and get help competing with others. With using these features, the players can choose to duplicate bridge, save the last game, load the last saved game or start a new one. Also, the players can choose to play deals with all cards faced up or to use the game’s vocal bidding hints with explanations when they play alone or with others as the vocal play hints anytime they play. The dealers can be chosen by the player and they can be static or rotating. The game offers players to choose who will get the best hand of cards or the type of deal they want to play, choosing among Slam, Game, No Trump or Part Score Deal. The bidding systems offered have options as Basic, Intermediate and Advanced with which the number of bidding conventions players can be under controlled. With over 2 million deals offered players can compete in tournaments from Cavendish, ABF and ACLB, playing with friends and people from the whole world, whenever and wherever they are. 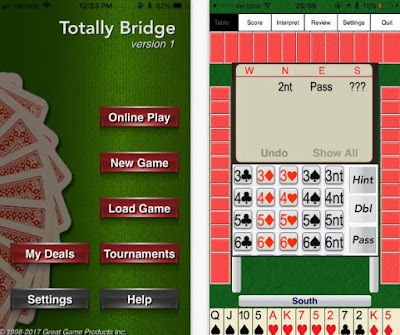 Download it on App Store and be a part of bridge tournaments!